Absolute Koi are excited to announce the launch of a brand new range of flexible PVC fittings called ''Boots''. These are an invaluable tool to stop a multitude of headaches for any pond keeper, pond builder or anyone involved in piping water. Have you ever had to cut and re-glue pipework and fittings when changing over filters or equipment on your pond? Have you ever made a mistake and had to get the hacksaw out? Have you done this more than once? These flexible pipe adaptors are used by professionals nationwide. These high quality pipe adaptors are made of tough elastomeric polyvinyl chloride which makes them strong, resilient and unaffected by most conditions. They are also resistant to chemicals, ultraviolet rays, and fungus growth due to the specially formulated properties of the material. These flexible pipe adaptors are supplied with 300 series stainless steel clamps, which are corrosion resistant and rustproof. Additional band slots have been added for greater flexibility and the clamps are specially designed for greater sealing efficiency. These couplings adapt to different types of pipe; plastic, copper, steel or lead to cast iron, plastic, copper, steel or lead. Installs easily with a screwdriver, nut driver, or socket wrench. No special tools needed! These flexible pipe adaptors have earned a reputation for consistent, superior performance and you can have full confidence in their quality and reliability. For sewer, drain, waste, and vent piping. Positively seals any drain connection. These Flexible Elbows are used by professionals nationwide. These high quality flexible couplings let you connect all common household drain, waste, and vent pipes quickly and easily without using special tools or fittings. They're the ideal replacement for fittings cut out at the joint during alteration or repair. These connectors are easily installed by tightening the 300 series stainless clamps. Made from flexible polyvinyl chloride these connectors fit cast iron, steel, plastic, cooper and lead. These Flexible Elbows have earned a reputation for consistent, superior performance and you can have full confidence in their quality and reliability. Exceptionally flexible and extra long. Ideal for limited space connections. These Flexible Tees are used by professionals nationwide. These high quality flexible couplings let you connect all common household drain, waste, and vent pipes quickly and easily without using special tools or fittings. They're exceptionally flexible and extra long to be the ideal replacement for fittings cut out at the joint during alteration or repair. The connectors are easily installed by tightening the 300 series stainless clamps. Made from flexible polyvinyl chloride these connectors fit cast iron, steel, plastic, copper and lead. These Flexible Tees have earned a reputation for consistent, superior performance and you can have full confidence in their quality and reliability. These Flexible Straight Connectors are used by professionals nationwide. These high quality Flexible Straight Connectors are made of tough elastomeric polyvinyl chloride which makes them strong and resilient. They are also resistant to chemicals, ultraviolet rays, and fungus growth due to the specially formulated properties of the material. These Flexible Straight Connectors are supplied with 300 series stainless steel clamps, which are corrosion resistant and rustproof. Additional band slots have been added for greater flexibility and the clamps are specially designed for greater sealing efficiency. These couplings adapt to different types of pipe; cast iron, plastic, copper, steel or lead to cast iron, plastic, copper, steel or lead. Installs easily with a screwdriver, nut driver, or socket wrench. No special tools needed! 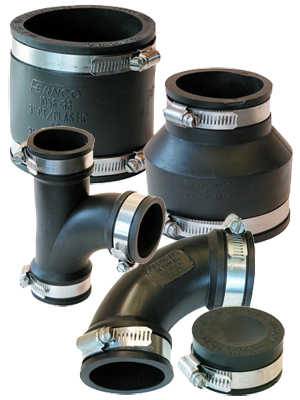 Fernco's pipe adaptors have earned a reputation for consistent, superior performance and you can have full confidence in their quality and reliability. Flexible Stop End Caps are used by professionals nationwide. These high quality Flexible Stop End Caps offer a quick, easy way to cap pipe ends, cleanouts and open test pipes. Made of flexible polyvinyl chloride, they're suitable for above ground or underground use on cast iron, steel, copper or plastic piping. Flexible Stop End Caps are designed to fit all drain, waste, and vent pipe materials in a given nominal size. The convex face allows the cap to withstand greater pressure for testing purposes and minimizes ballooning. Flexible Stop End Caps have earned a reputation for consistent, superior performance and you can have full confidence in their quality and reliability. These Flexible Straight Connectors are supplied with 300 series stainless steel clamps, which are corrosion resistant and rustproof. Additional band slots have been added for greater flexibility and the clamps are specially designed for greater sealing efficiency. These couplings come standard with the Nexus Eazy 210 and Nexus Eazy 310, but now are available as a spare part. Installs easily with a screwdriver, nut driver, or socket wrench. No special tools needed! These Flexible Straight Connectors have earned a reputation for consistent, superior performance and you can have full confidence in their quality and reliability. For Nexus Eazy 210/310 Inlet or Outlet.